$389.99 & FREE Shipping on orders over $59 $35. 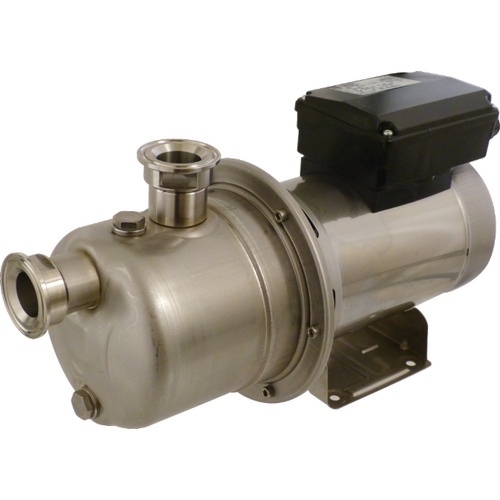 This pump features a stainless body, housing, and bracket. It utilizes an impeller made from food-grade plastic. The impeller does not push air by itself so to prime it you unthread the priming nut on top of the filter housing and fill with water or wine. Comes with 1.5" Tri-Clamp inlet and outlet. Has a .8 hp motor and moves 13 gallons per minute with no head. Will pump up to a height of 70'. 110v. Overall dimensions are 14.5" L x 7"W x 7"H. Weighs 15.4 lbs. Optional by-pass can be installed to restrict flow up to 25%. This pump can handle some small solid particulate, such as grain particles, and is food grade up to 113° F.